A rear tire blow-out caused the vehicle to rollover while traveling on U.S. 77 near Raymondville. The accident left one dead and six others injured. 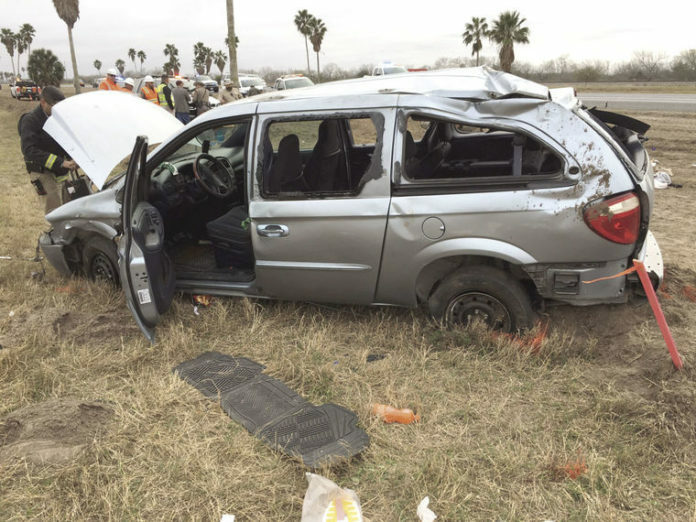 RAYMONDVILLE — A car crash yesterday afternoon sent seven to the hospital and left one dead. According to Texas Department of Public Safety, a Dodge Caravan had a rear tire blow-out causing the vehicle to rollover. The vehicle was traveling on US 77 about five miles north of Raymondville. Mexican national, Edgar Ivan Ramos, 29, died at the scene according DPS reports. Another person was air flown to Valley Baptist Hospital in Harlingen. Six passengers were transported by ambulance to hospitals in Harlingen. Preliminary investigation revealed a Dodge Caravan passenger van (occupied by a driver and seven passengers) was traveling northbound on US 77. Some passengers were not restrained by safety belts. Two persons were ejected from the vehicle. DPS Troopers are further investigating this fatal crash.